The Tingley Storm-Champ Lightweight 2 Piece Rain Suit gives you comfortable full-body protection. 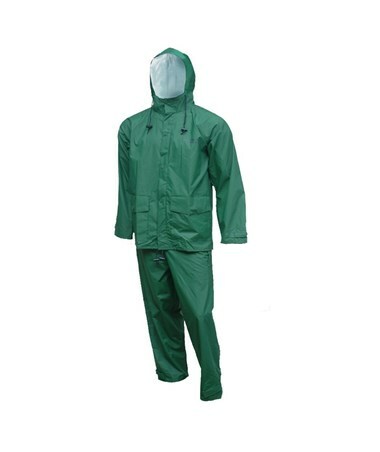 This rain suit is 100% waterproof, with electronically welded seams to seal out drips and drizzles. Made with a 0.20mm PVC coating over nylon taffeta material, this protective rain gear can keep you covered all day long. 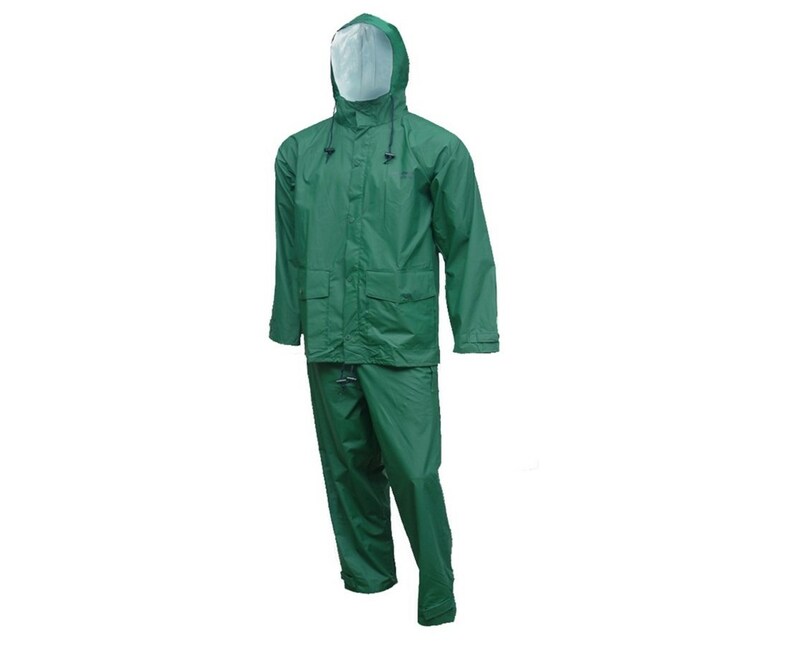 This rain suit is designed with a variety of features to keep you dry and comfortable. The attached hood with drawstring and throat guard keeps your head dry. There is also a drawstring around the bottom hem of the jacket to keep out water in windy conditions. All drawstrings have barrel locks for easy adjustment. Hook and loop cinch straps at the wrists and ankles provide more protection. The jacket has a front zipper closure with a storm fly that snaps down with heavy-duty non-corrosive snaps. The rain jacket is constructed with vented cape back for comfort and breathability, with eyelets that allow you to conspicuously display your hunting or fishing license. The rain pants have a drawstring elastic waist for a secure fit on different sizes and figures. You have plenty of pocket space in this 2 piece rainsuit. The jacket has 2 front pocket with flaps and snap closures to keep the contents nice and dry. The trousers have 2 side pockets with snap closures. You'll have plenty of places to put snacks, tools, and other equipment. The tough, lightweight material resists tears and snags for durable protection. This attractive rain suit will keep you cozy throughout an entire day of work or play. It also comes with a handy carrying bag, great for storage or transport. The Tingley Storm Champ rain suit comes in royal blue, available in sizes S-5X, and forest green, available in sizes S-3X. 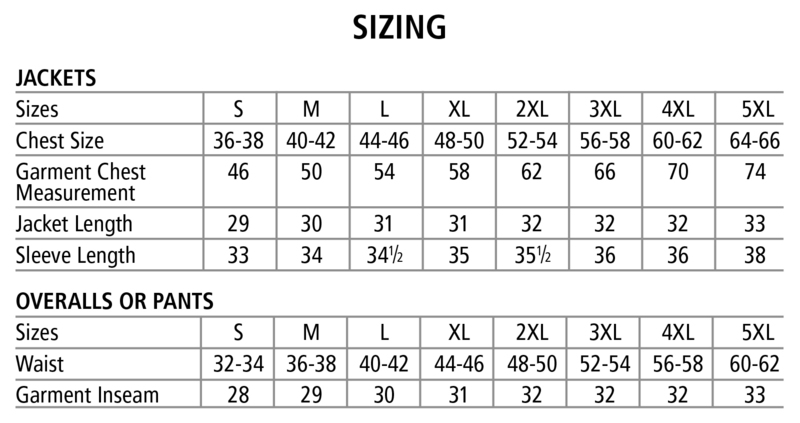 This 2-piece rain suit is designed to fit chest sizes from 36” - 66” and waist sizes from 32” - 62”. Remember that this rain gear is designed to fit over your clothes, so you should take measurements over the clothing that you are planning to wear. Please click on the “Sizing Chart” icon for details on the sizing and instructions on how to measure for your rain suit.